At CMCS we give teaching and study to the next generation of Christian and Muslim leaders, working in partnership with other institutions and individuals to provide the teaching they need. At CMCS we provide high quality teaching and study to the next generation of Christian and Muslim leaders. Rather than offer qualifications directly, we work in partnership with other institutions and individuals to provide the teaching they need. We provide tutoring and supervision to postgradutes and undergraduates, particularly at Oxford University, but also elsewhere. We also supervise visiting students and provide study consultations and guided reading. 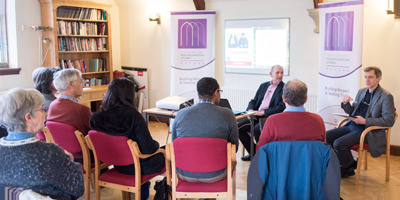 The Annual CMCS Summer School has been running since 2015, bringing together Christians and Muslims to share a week of academic study, lively discussions and giving their own presentations, in a residential setting where participants live, eat and relax together. Our popular seminar series runs regularly at the Centre through each term. Periodically we offer courses and lectures both in Oxford and throughout the world. Our reference-only specialist library is located at the Centre in Oxford. The collection includes material published in South Asia and Africa not readily available elsewhere in Britain. How Does it Feel to Study with CMCS?